When I walked through the doors of Santa Maria della Vita, a baroque church on a side street in Bologna, Italy, it took awhile for my eyes to adjust to the dim interior. A friend had told me there was something in this church that I needed to see. I made my way to a side chapel so cloaked in shadow that I couldn’t distinguish the forms in the darkness. After dropping a coin in a machine against the wall, light flooded the space. I gasped. I was looking at grief suspended for centuries. The intensity of emotion captured in clay was like a punch to the gut. Christ lay dead at my feet, but it was the terror etched on the faces of the women surrounding him that made my heart pound. I was looking at “Compianto del Cristo Morto,” Lamentation over the Dead Christ, a collection of seven terracotta sculptures modeled by Niccolò dell’Arca in the 15th century. It’s impossible not to identify with these figures that are so animated, so life-like, scaled to relate, rather than to impress. John, Joseph of Arimathea, Mary Salome, Mary the mother of Jesus, Mary Cleophas and Mary Magdalene—they’re all here gathered around their lifeless Lord. They’re all so completely consumed by the excruciating moment that the viewer is left alone to decide whether to stay on the sidelines as a dispassionate observer or to enter into the emotion. It feels cruel to freeze this moment, as if the sadness would never end, as if Sunday would never come. On closer inspection, I realize it’s only the women who are emotionally expressive. The emotion of all four women is extreme, especially compared to the nearly stoic presence of Joseph of Arimathea and the bewildered, quizzical look on John’s face. Even for women who would consider themselves deep feelers, the emotion displayed by these women seems almost over the top. Mary Magdalene has a reputation for being emotional, if not unstable. Dorothy Sayers in her dramatization of the life of Christ, The Man Born to be King, draws attention to the varied emotional responses of the women gathered to accompany Jesus on the hard road to Calvary. “Passionate, emotional, purely human, despairing” are the words she assigns to Magdalene. Contrast that with her description of Mary the mother of Jesus: “Restraint, dignity, strength—and that stillness and prenatural lucidity which sometimes accompany extreme anguish of mind.” Mary the mother is marked by “granite self-control,” while Mary Magdalene is nothing but a puddle of tears. Sayers isn’t the first to envision Mary the mother as supernaturally composed at the foot of the cross. 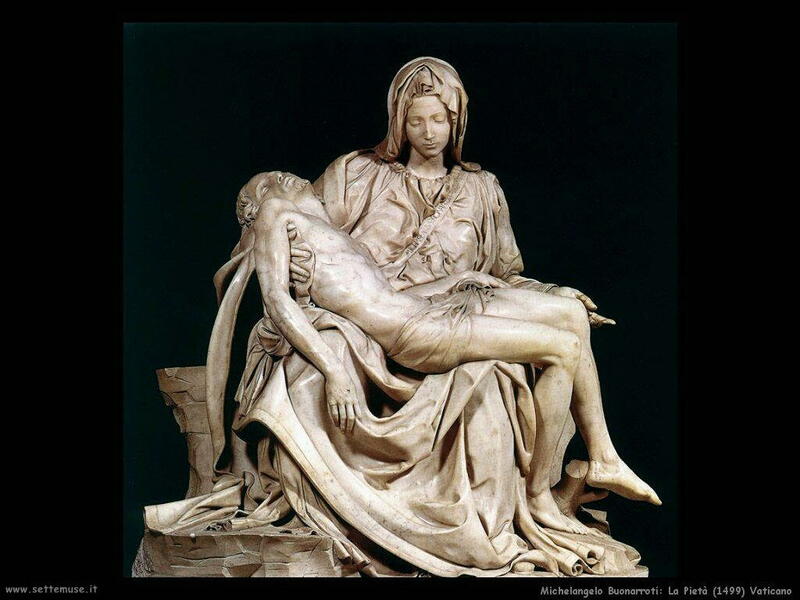 I think of Michelangelo’s Pieta in St Peter’s Cathedral in Rome. As Mary cradles her son’s body, she appears thoughtful, not overcome. The polished marble surfaces gleam. Her face is youthful, lovely, pensive, serene. Her emotion perfectly contained. Her grief internal. She’s not human; she’s all saint. The sculpture is too gorgeous, too luminous, to be true to life. The gospel accounts are so spare. The authors edit out the emotional undercurrents leaving us to wonder how the players in this narrative experienced the trauma of the crucifixion. Is it possible that a mother observing the public torture and humiliation of the son she nursed and rocked and comforted could have been so insightful in her grief? I doubt it. I know the rush of adrenaline and wave of horror that surges through mind and body when witnessing the wounding of my own child. I watched my 2-year-old daughter run straight into a swing flying upward full force. The impact to her left cheek lifted her off her feet and sent her sprawling. I was practically blind with disorientation as I picked her up and held her body convulsed by sobs so deep they were silent. And I know that is nothing compared to what Mary saw. Nothing compared to the violence that Mary witnessed. A stark contrast between Mary the mother of Jesus and Mary Magdalene is misleading. Tradition has tended to paint one as a sinner and one as saint, one as prostitute and one as virgin. But assigning these two women to opposite poles on the moral spectrum obscures their complexities. There is never a suggestion in the text that Mary Magdalene was a prostitute and never a reason to think that after Mary birthed Jesus she remained a virgin. All we know about Magdalene’s personal history is that Jesus freed her from the oppression of seven demons—and it’s important to note that demonic possession is not synonymous with licentiousness anywhere else in Scripture. We also know that Jesus grew up with brothers and sisters, a pretty clear indicator that Mary’s marriage to Joseph was consummated. They were both flesh and blood women—both emotional, both physical, both spiritual, both saved by grace, both faithful, both so devoted to Jesus that they stayed with him to the bitter end. All the women who accompanied Jesus to the cross had reason to love him from the depths of their being. They all experienced the same excruciating sense of loss when they watched his final exhale as he released his spirit into the hands of the Father. In this moment their emotion was justified. Niccolò dell’Arca’s terracotta sculptures portray these women as unified in their grief. All the women wail. They weep and mourn together. And we are invited to join them as we reflect on the meaning of Jesus’s suffering and death. It’s tempting for me to run past the horror of the cross or to allow the glory to mask the shame entirely. But I know that I haven’t really honored Christ if I don’t pause to attempt to understand the tragedy to which these women react so violently, so appropriately—the author of life humbled to death. They challenge me to enter into the story, to let the emotion rise up, to contemplate my part in this death. But unlike these figures frozen forever in a wave of despair, I have seen the amber breaking on the horizon. I know Sunday is coming. I know mourning gives way to celebration. I know the grief gives way to laughter. See http://www.italianways.com/the-mourning-over-the-dead-christ/ for closeups of each figure. Thanks for this thought provoking post, Tina. These sculptures and your reflections are powerful! This day between crucifixion and resurrection beg us to quiet our souls and listen!